Advertisements on NBA uniforms are inevitable—the association logo is heading to the back of the uniform to make room, and the only reason a 2.5" x 2.5" ad patch wasn't on the front shoulder last year was because they couldn't agree on how to split up the money. But in case you were still clinging to the hope of aesthetics in the face of capitalism, you can give up: the NBA's massive new TV deal specifically accounts for revenue from jersey ads. According to sources involved in the discussions, if there's a national brand with a jersey deal that would have bought time on ESPN or TNT's NBA game telecasts — think Coca-Cola or Samsung — the two networks would get specific commitments from that company to also buy TV advertising during any nationally televised games featuring that sponsored team. Sources familiar with the TV deals admit both networks pushed hard to be allowed to sell ads on team jerseys outright, but the league balked at handing over the potentially lucrative rights. 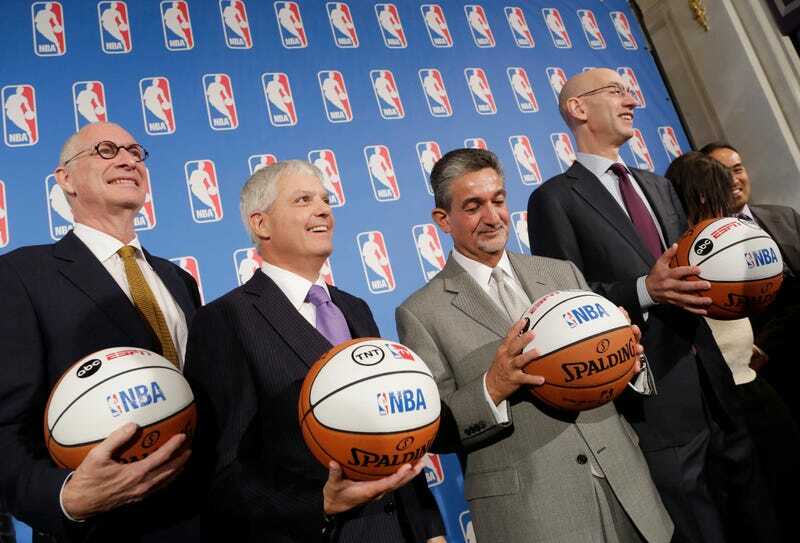 Under the new TV deals, NBA teams maintain the rights to sell the jersey advertising, which has an estimated value ranging from around $800,000 for small-market teams like the Memphis Grizzlies to more than $10 million for large-market teams like the Los Angeles Lakers. The precise formulas for splitting up revenue from jersey patches haven't yet been worked out, but you can rest assured that as soon as they are, the discussion will progress to adding a second patch. And then a third. If you're willing to fight for the American model, where our ads are everywhere except on uniforms, the NBA is not the hill to die upon. Retreat to another sport, so you may fight again another day.